Some of the more expensive cameras lets you to extend your exposure time even for few seconds (Sony 505V up to 8 sec). That's cool, but when you actually try it, your image will be .... full of stars! Tiny little white dots, all over. Hot pixels are part of the CCD reality. These pixels are never the same and each of them has different charge leakage rate. 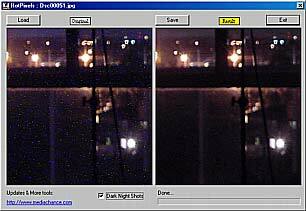 Because of different quality and sensitivity of each pixel, they will start appearing as a noise - but if you would able to expose for much longer, finally all pixels will lighten up. But the cameras which allow for longer exposures will always have this problem. HotPixel Eliminator is here to fight against HotPixels! It will successfully remove most of the HotPixels traces. You could also use Dark Night Shots option to remove additional "blue" noise chunks. These will appear in extremely long exposures (6-8 sec). ISO 100, 8 sec We use HotPixels Eliminator - "stars" are gone! Now with Dark Night Shot we remove also the blue chunks. For our test image I used an extreme set up. I shoot from the inside of the room on a tripod, in the night with no light, only the lights from street. Actually it was so dark, so I couldn't see the camera. This 8 sec shot shows much more details and light than it was visible to the naked eye. HotPixel Eliminator uses a special custom made procedures - and thanks to them HotPixels is not only the best Hot Pixels removal, but also the fastest. If you like our tools, please put a link or banner to your site. Get the graphics here. The image on the left is an original image taken with Sony 505V (2.6 MegaPixels), F2.6, ISO 100, 8sec exposure. Some of your deep dark night shots may have these large chunks of blue noise. You can use the Dark Night Shot option to completely remove these. The procedure does not remove the blue channel - it removes only these noisy chunks, but the color tone of the image (especially on long exposures) could change. After the correction the tone may actually appear more close to reality. Whatever you prefer and whatever is good for you. The HotPixels Eliminator will allow you to preview image only in the real size - so you always see 1:1 what it does. This should be the first filter you are applying on the image. Then of course you can size it down the image and adjust Levels. With HotPixels Eliminator you can produce the most beautiful night shots. So what is the normal, safe exposure time? It will vary from camera to camera and the environment (mostly temperature). Anyway, I would consider it a good CCD if it doesn't show any HotPixels in total dark with exp. time around 1 sec. 2 sec seems to be an limit for consumer RGB CCD when the pixels starts to be visible. Can I use it for normal, not Hot Pixels images? Sure, but it won't have any effect. Not even noise reducing effect. You should use other our tools instead. Really. Is there a way how to prevent this on first place, or use different techniques? Theoretically, if you cool down the camera this should lower the charge leakage of pixels. However do not put camera in the freezer - the water condensation will damage the CCD, electronics and lens. Anyway, colder camera should perform better than warmer. There is other way how to remove the Hot Pixels noise. It is used for example in astronomy. (Imagine these guys trying to distinguish stars from Hot Pixels!). Just after the shot, cover the lens and take a "Black Frame" picture. Later you could remove the noise by substracting the blind shot from the real shot. In such a short period during one session the Hot Pixels will be on the same spot. To use this method try BlackFrame NR. Subscribe to our newsletter to know about it first!